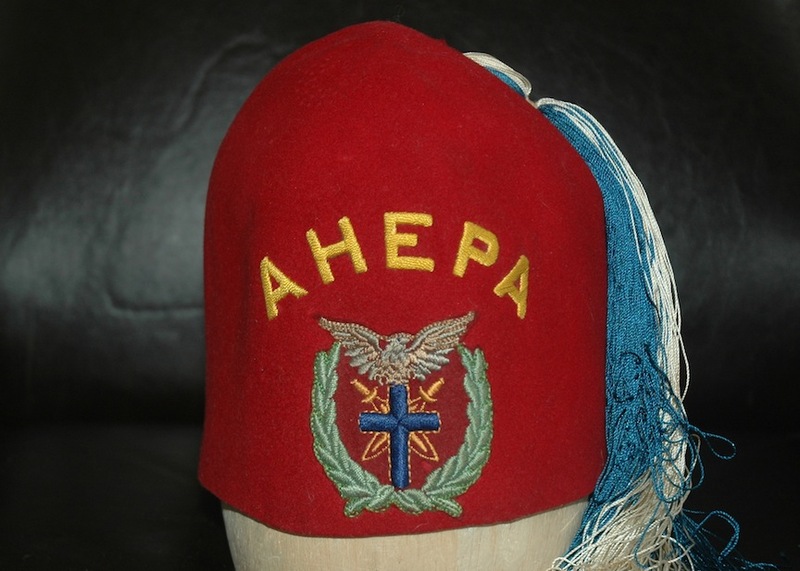 Blue felt Greek American Protective Association (GAPA) fez. Gold-colored pot-metal circular medallion embossed with design showing a bent arm with a sleeve rolled up past the bicep with lightning bolts clutched in the fist (arm of Zeus?). Letters G A P A are somewhat scattered around the field, and a stepped fret or key design encircles the whole. Gold bullion embroidery GAPA above the medallion. On the sinister side of the fez, a tall, thin red/white/blue ribbon with pointed end up is stitched to the fez. There is no tassel, and the crown of the fez has been inverted and stitched together, to turn the fez into a military style cap. Color is a deep grey blue, but looking inside reveals that it was originally royal blue and has faded. Black felt fez with black silk tassel. Silk floss embroidered emblem with two translucent plastic bezels for rhinestones, which are missing. Emblem consists of a scimitar with yellow handle and hilt, and white blade, with the two rhinestone bezels at the balls of the hilt. 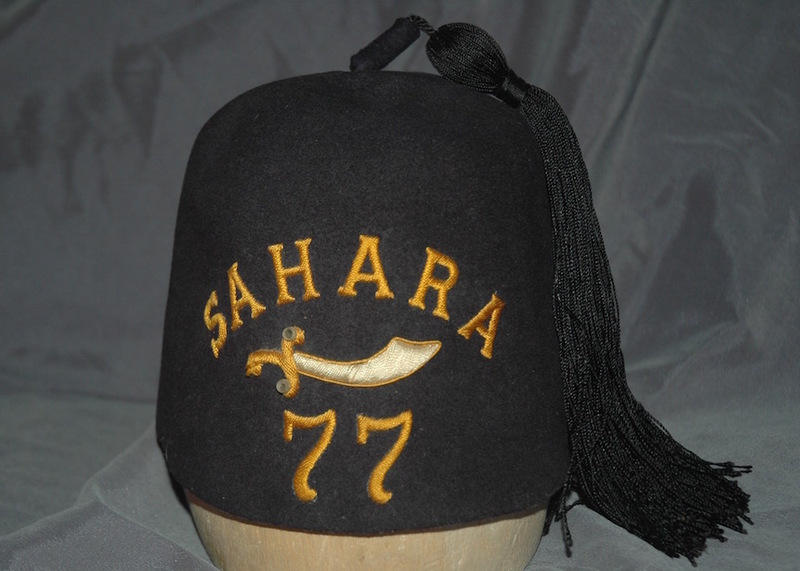 Above reads SAHARA, and below is the number 77. Princes of Bagdad was the fez-wearing side order of the Ancient Illustrious Order Knights of Malta. They met in Siestas, and the number 77 was a reference to their ritual, as well, as the rule (who knows how seriously it was meant) that there would never exceed 77 members in a Siesta. Maker: Label inside, whip-stitched over the back of the embroidery. With an image of a fez. 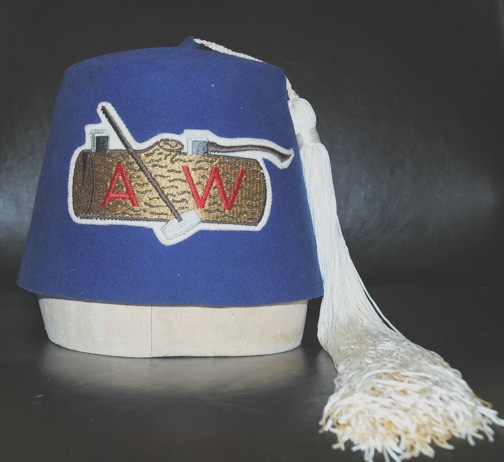 Blue women’s fez. Owner’s name Estella Watts embroidered onto maker’s tag. The American Woodmen are the African American parallel group to the Woodmen of the World. AW was founded at Denver, CO, and is co-fraternal, admitting both men and women. 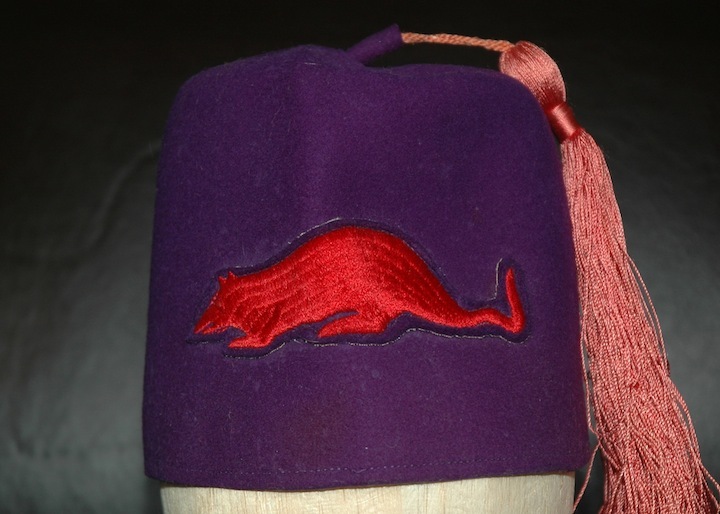 Purple Trench Rats fez with (faded) red tassel. Emblem is an embroidered patch stitched to fez, depicting a solid red rat in profile. There is little to suggest a date for this fez, top shows standard perforation, so I am basing my ca. 1970s on the quality of the sweat band, which is cheap and crispy, and allowing some time for the tassel to have faded. Teal UAOD fez with yellow tassel. Large, patch across front reads DRUIDS, with a complex emblem above, consisting of a wreath made of two different branches surrounding a post and lintel architectural element reminiscent of Stonehenge, over which two staves are crossed, with a fire burning above. A downward-pointing triangle at top encloses an eye. Below the patch is embroidered LOS ANGELES. 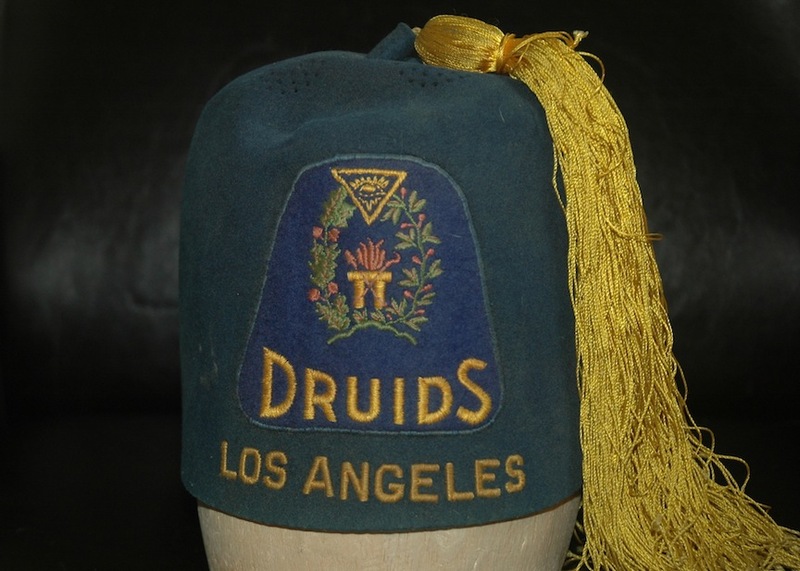 The United Ancient Order of Druids was founded in London in 1717, and came to the United States in 1830. They meet in Groves. This fez ID’d as UAOD against images online that match the Stonehenge symbol. 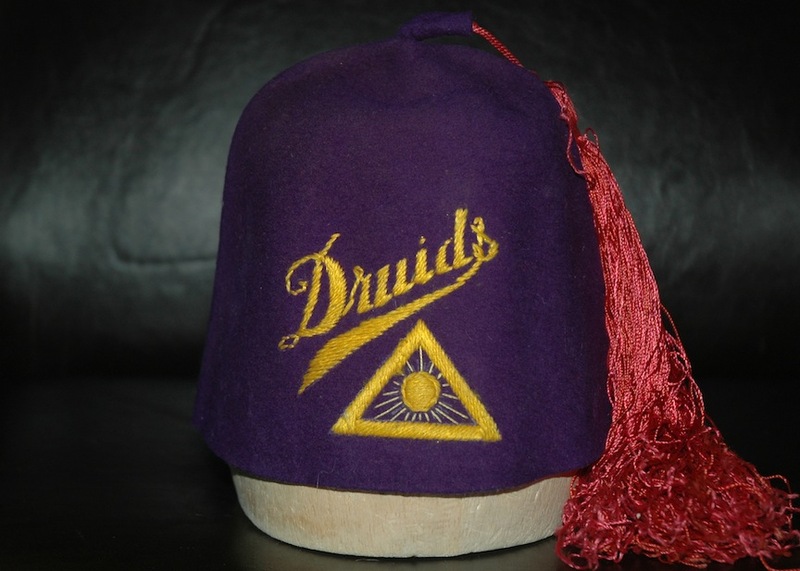 Purple Druids Fez. Yellow wool yarn embroidery has a yellow triangle, point-up, with a sun inside, and with “Druids” in angled cursive above. The design is unavoidably, undeniably similar to Sciots fez designs. Felt is deep purple, tassel is rose, but very possibly is not original. Has been stored flat, with pronounced crease across top parallel with front panel. The top is perforated, but only barely, the vent holes are nearly closed and almost undetectable. No sweat band. Made by Seagrave Bros of San Francisco. I have no idea if this fez belongs to the same order as TAFC.2013.1. 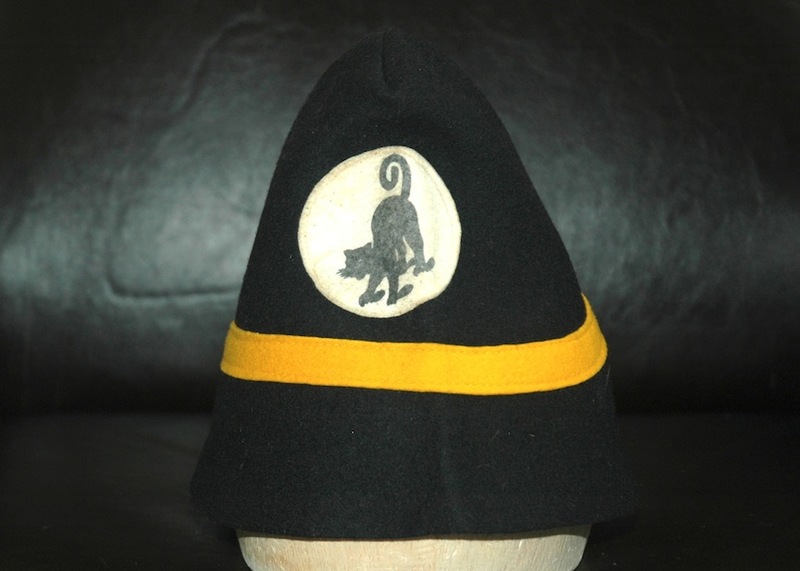 Hoo Hoo hat, black felt conical cap with a yellow felt band around, with Hoo Hoo cat emblem patch above. The patch is a flat felt disk, apparently with no heavy backing, with the cat printed on it. The hat is essentially a cone, though it is sewn with a seam, which flattens it in one direction. It is a very simple affair. Lacking any brim, tassel, or other dimensional or loose element, the ID# tag is merely placed inside, as with a TCL pyramid. Dark navy blue United Commercial Travelers fez with off-white tassel. Emblem is done completely in embroidery, perhaps not of spectacular quality. The borders of the emblem tend to meander a bit, rather than being tight and smooth. Emblem is in yellow and royal blue, a crescent shape opening downward, with chains to a blue traveling salesman’s case, which has UCT picked out in yellow. The steel reinforced corners are also illustrated, and the handle on the case is actually a loop that stands away from the fez. 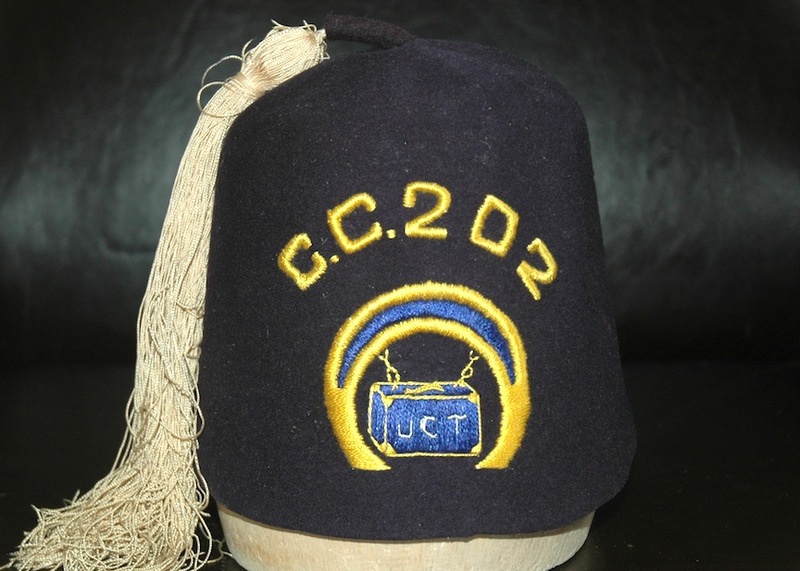 Over the emblem is embroidered C.C.202, which would be the local unit, referred to as a Council Chamber, of the wearer. No inner band, and no perforations of the crown suggests a somewhat older piece, although the “feel” is not that of a turn of the Century piece, especially with the bright (aniline?) dye of the embroidery. I surmise an early mid-Century date. 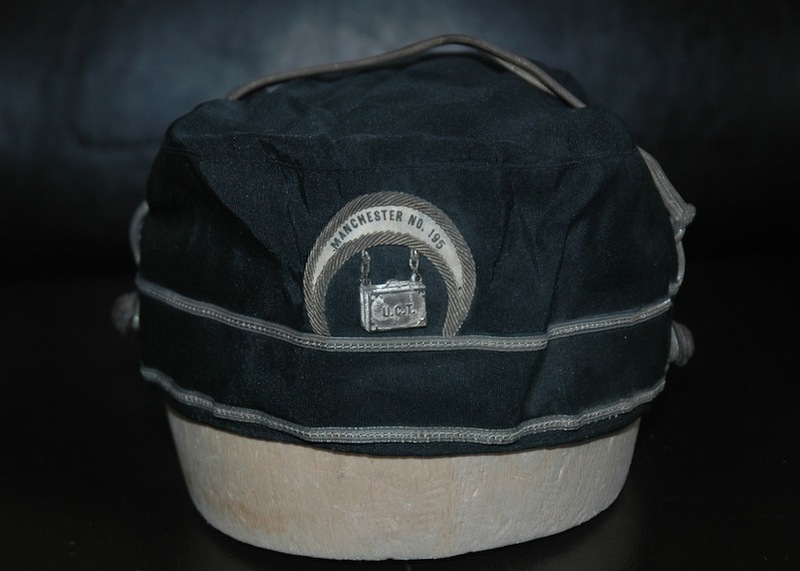 A black United Commercial Travelers cap, styled clearly after the prayer caps if the Scottish Rite. Done in black satin, with silver trim on a black ribbon running around, a silver bullion cord over the top from silver buttons (featuring an American eagle design), and silver bullion embroidered UCT crescent. Inside the crescent is white satin printed with MANCHESTER No.195. The chains holding the traveling salesman’s case are actual metal links, and the case is a tiny die-cast metal plaque, which hangs free of the cap. While it is common for fraternal organizations to have perhaps somehow aped the Shrine, this is the only example I know of where a non-Masonic organization has aped the regalia of the Scottish Rite, and very clearly so. Real leather sweat band inside. Bullion cord is of reasonably high quality. 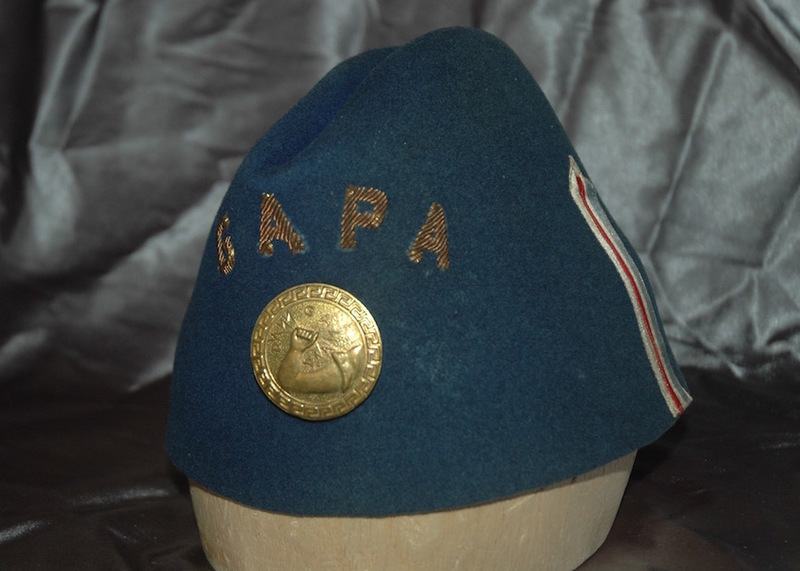 Rough date of ca.1940 based on (missing) sweat band and no venting on top.